A bullish gap is where the stock price opens above the previous close by a wide margin. The gap will usually propel the stock higher for the next few days to months. Therefore, a trader who spots this gap may want to employ bullish trading strategies to trade this stock on the long side. A stock that experiences a bullish gap will open higher than the previous close with no trading in between the prices during regular hours. Which is why you will often see a void or white space in the chart. Stocks often gap up because of good earnings or some good news. 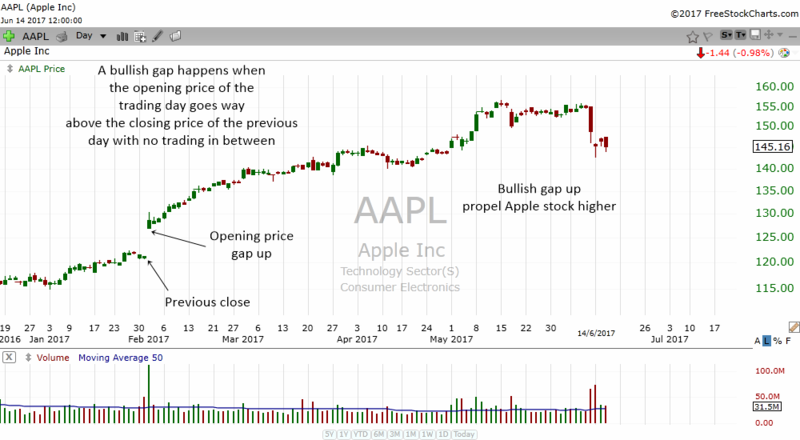 In the chart above, you can see how Apple gap up on heavy volume in February. Can you see how the opening price is way above the closing price of the previous day? A gap up tells us that many traders were looking at the stock and they all knew that the stock is a good one. Therefore, too much demand makes the price go higher. 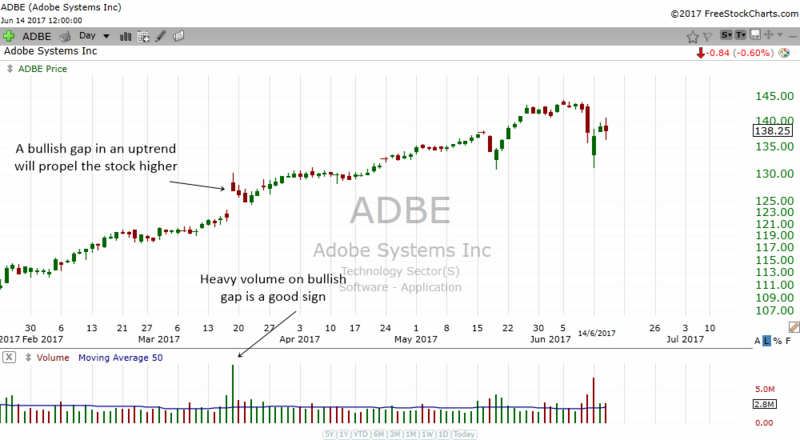 In the chart above, you can see how ADBE was in an uptrend even before it gapped up. When it gapped up on heavy volume, it told us that buyers were stepping in. The gap up on heavy volume in an uptrend help pushed the stock higher during the next few months. When a stock gaps up after a bullish pattern forms, it is also a sign of increasing buying and demand. 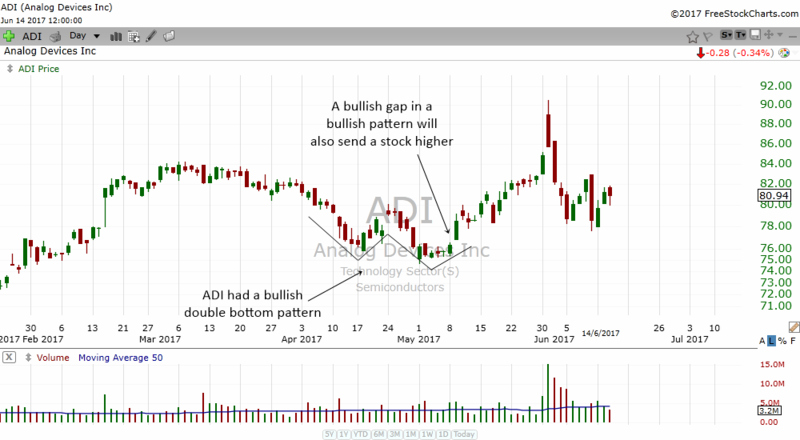 In the chart above, you can see how ADI formed a double bottom in the daily chart. After forming the right side's bottom, the stock had a gap up. This is a good sign and helps to push the stock higher for the next few weeks. 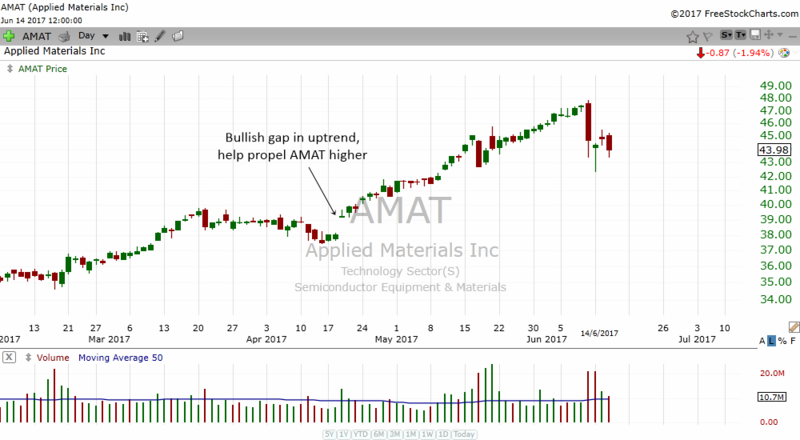 AMAT also had a gap up while it is in an uptrend. Notice how powerful a bullish gap up can be in an uptrend stock? They often send the stock higher. Sometimes when a stock gaps above a downtrendline, it can be one of the most powerful signals that show us that the bulls are coming in. 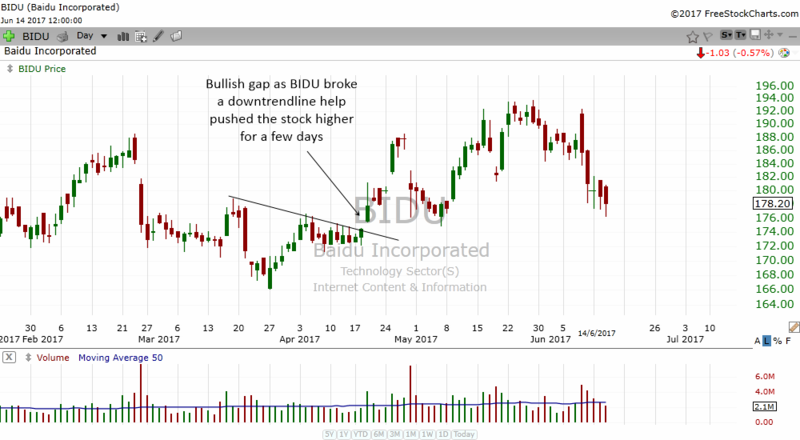 Look how BIDU shot up for the next few days when it gap up above the downtrendline.